Are any of you still eating leftover turkey? 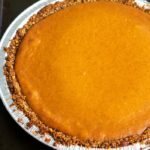 Pumpkin Pie is one of my top five favorite pies and this gluten free pumpkin pie is one that you should make even for Christmas. Wait! Did I say Christmas? It’s hard to believe this past week went by in a flash. 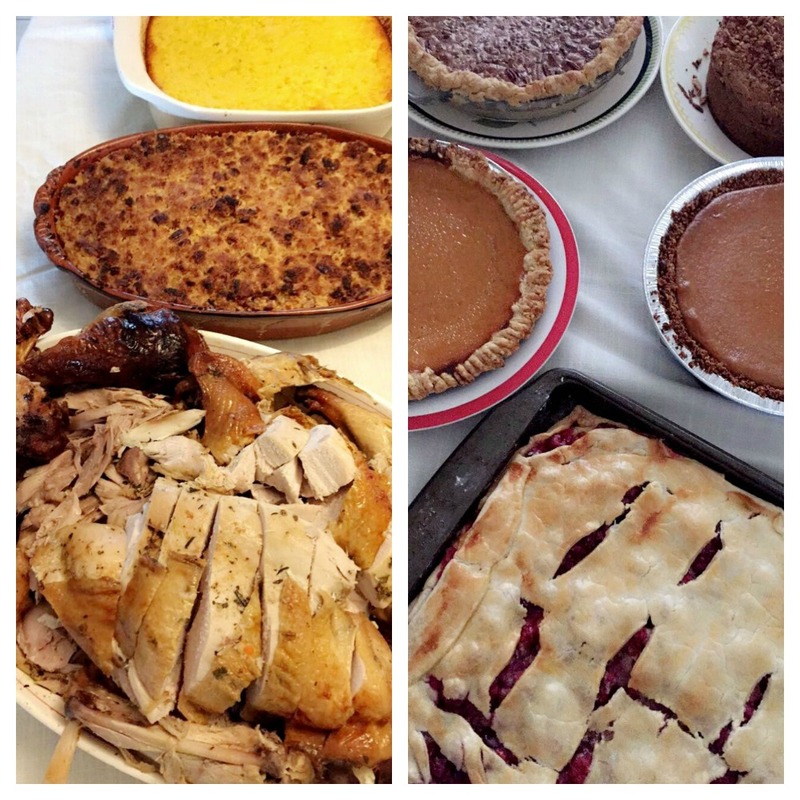 After spending weeks of deciding what our menu would be and thinking what desserts I would make this year, it’s now time to plan for my favorite holiday of the year! We had turkey and all the sides for four days. There was the turkey our friend made and brought over and his stuffing. There was my husband’s Italian chestnut and sausage stuffing (amazing!! )and then there was the turkey dinner my mom made at her house this past Sunday. There has been a lot of time spend with family and friends and turkey and we have been very happy! How was your Thanksgiving? As usual, ours was a feast celebrated with a lot of Italians (and this time, a few Portuguese friends that are like family). We all contributed with something and as I mentioned, I was in charge of the desserts. It’s funny that even restaurants in Italy have Thanksgiving menus. I just saw on Twitter a menu at a restaurant in Florence to celebrate to Thanksgiving and they had crostata di zucca gialla for dessert (a pumpkin tart). But I’ve even seen on Italian cooking shows the host making American “Pumpkin Pie”and you can come across plenty of recipes on Italian food blogs for “Pumpkin Pie”. And a lot of time with pies! What can I tell you, I just love to bake pies, tarts and crostatas. I was planning to make some gluten free desserts for our friends that were coming for the feast last Thursday but also for one of my family members. We have been trying to cut out gluten and it hasn’t been easy. It’s actually been lots of fun experimenting with different flours and different ideas. Like this pumpkin pie!! The crust is so easy to make. It comes together in minutes and is so light! I did make my regular crust for one pecan pie and another pumpkin pie and I also bought the Whole Foods gluten free pie crust to give it a try and it was flaky and very good! Can I just brag a little about the pecan pie? I haven’t made it in a few years and it was just because it takes a few extra steps and because I was trying different recipes out. But what a regret! That pie is something you have to try, if you like pecan pie! So our Thanksgiving was a little more Italian than American this year. We invited our friend Aldo from Calabria. He brought over enough food to feed about 50 people. There were trays of stuffed cannelloni (stuffed with ricotta and with meat). There were 3 different trays of stuffed peppers (large and small peppers). 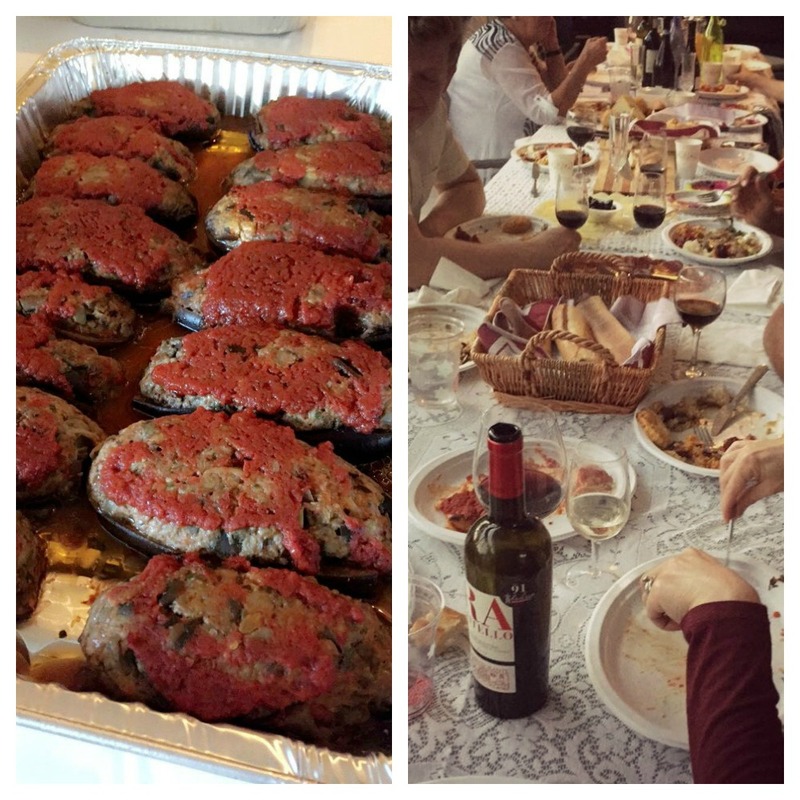 He also made stuffed eggplant Calabrese style and also another small try of a vegetarian lasagna. It was so hard to pass his Italian buffet on the way to the turkey spread and not try a little something from each tray. There were almost 20 of us this year and everyone left with containers of food and there was even some to share with neighbors and leftovers. We were blessed with friends, family, and delicious food. The pie crust was delicious! I found the recipe last year in the Thanksgiving issue of my Martha Stewart magazine. I used salted almonds instead of unsalted. I think you could even use pecans and have a perfect crust for your pie. 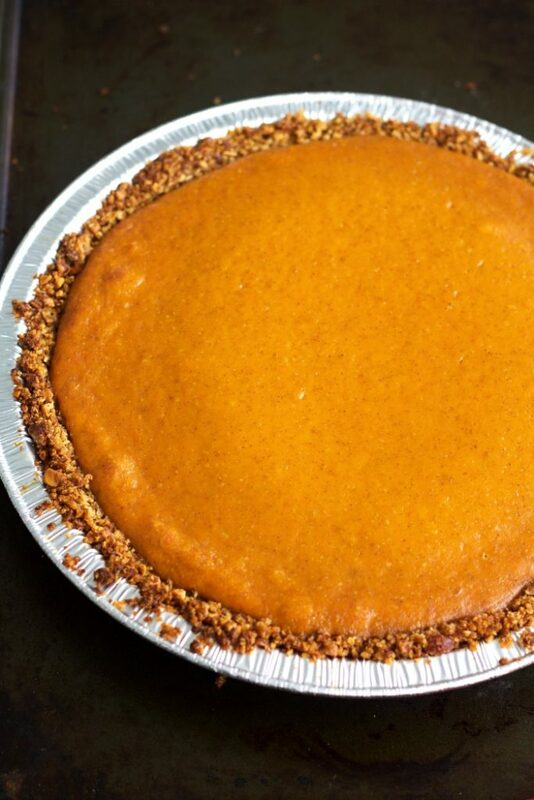 A delicious holiday pumpkin pie made with a super easy gluten free crust. Pulse cereal and almonds in a food processor until finely ground. Add butter, sugar and salt; pulse until combined. Use immediately. Preheat oven to 375 degrees. 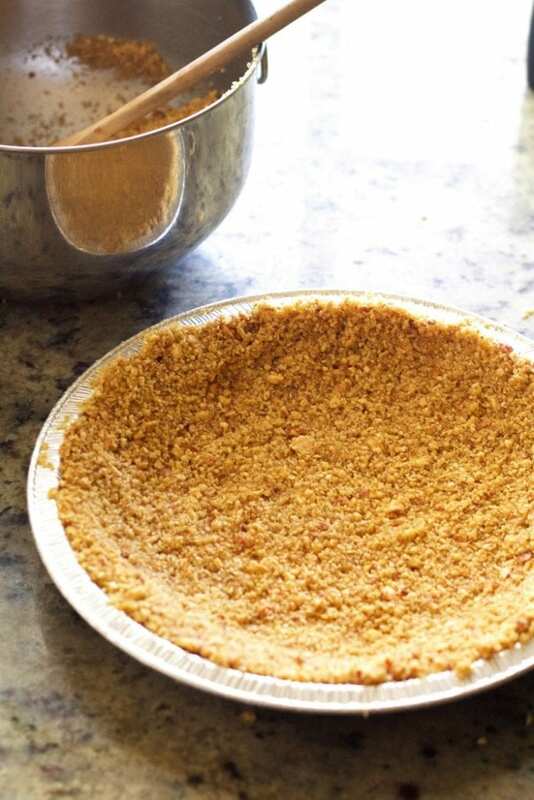 Press crust mixture into bottom and up sides of a 9-inch pie dish. Bake until golden brown, about 10 minutes. Let cool completely on a wire rack. Reduce temperature to 325 degrees. In a large bowl, combine pumpkin, coconut milk, sugar, eggs, vanilla and spices until combined. Pour into the crust and place on a baking sheet. Bake until filling is just set, 50 to 55 minutes. Love the idea of using cereal for the GF crust! This looks delicious! I love having gluten free options for the holidays! This looks perfect and I'll need to try that crust! I love experimenting with different flours too and even though no one in my family has gluten issues per se, I have been cutting way back on my family's gluten intake. It's actually pretty fun exploring alternatives. I love pumpkin pie! I especially love that this one doesn't exclude celiac family members! Ooooohhhhh, I like your twist on the crust! 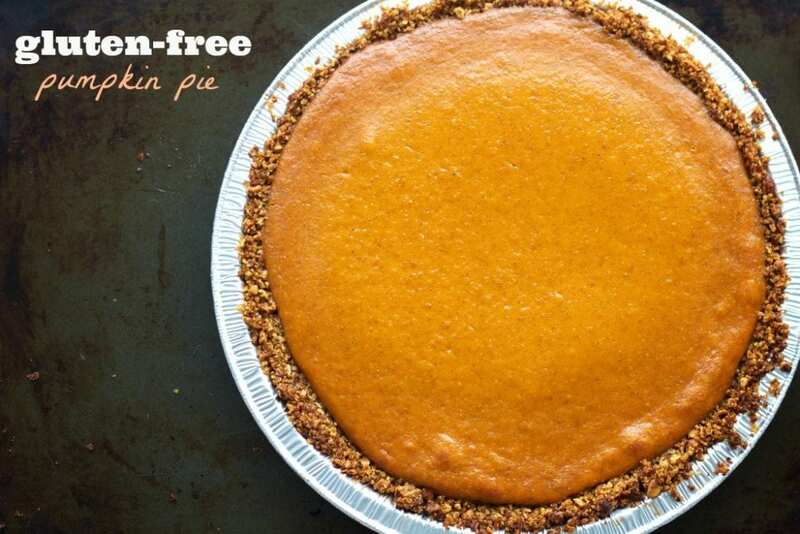 Normally we like our pumpkin pie with a graham cracker crust (either Schar or Annie's cinnamon or gingerbread bunnies) but this looks delicious! That crust sounds amazing! I can't get enough pumpkin pie this time of year. So perfect looking and LOVE that it's gluten free! What a delicious looking pie! So good! This is one stellar pie. I love that it's gluten free too. That crust is gorgeous. This crust is all sorts of amazing – the cereal addition is genius. It looks like you had quite the Thanksgiving feast! What a beautiful feast you had! You can never go wrong with a Pumpkin Pie over the Holidays! But to make it gluten free is even better!